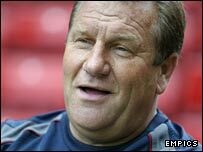 Stoke manager Johan Boskamp confirmed that he will be leaving the club following their 5-1 win at Brighton on the final day of the season. The Dutchman has been at odds with the club's Icelandic owners over a new deal and has decided to move on. "I'm now available to talk to other clubs and will probably end up in Belgium or Holland," he said. "I'm not sad but disappointed at leaving but football goes on and I think Stoke have a great future." Stoke have only a offered Boskamp a new one-year contract instead of two years and he is unhappy they have not sorted out his future while they consider a takeover bid by ex-chairman Peter Coates. "Now it's time to speak to other teams. I think it is over for me at Stoke. "I don't regret asking for two years. I have no contract and you can't work with two groups."